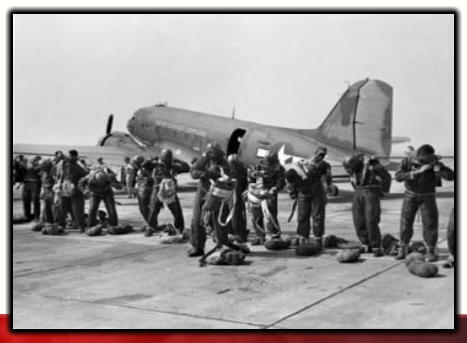 MAINTAINING AN IMPORTANT LEGACY In the winter of 1943-1944 twenty young African-American enlisted men were ordered to Fort Benning, Georgia to be trained as parachutists. These young men were pioneers because, never before in the segregated military system then prevalent, were “Coloreds” considered intelligent enough or brave enough to serve in combat units of any type and certainly not capable of being paratroopers. In early 1944 sixteen of these young men completed requisite training, in spite of being subjected to treatment designed to make them fail, and were awarded the silver wings of qualified parachutists. Shortly thereafter an additional trooper, having been delayed by a family emergency, was also awarded the much coveted parachutist badge. These men were led by former First Sergeant Walter Morris, and went on to form the cadre for the 555th Parachute Infantry Company at Camp Mackall, North Carolina. Several weeks after the “Test Platoon” graduated; six black officers also completed training and were awarded parachutists badges. Prominent among the six was Second Lieutenant Bradley Biggs. Now that the gates were open, a veritable flood of young black men volunteered for parachute training, causing the rapid evolvement of the seventeen enlisted men and six officers into the 555th Parachute Infantry Company and the 555th Parachute Infantry Battalion, which was attached to the 82nd Airborne Division at Fort Bragg, North Carolina. On a cold day in December, 1947, teary eyed members of the “Triple Nickles” Battalion stood in mass formation as this proud, one of a kind battalion was deactivated and reactivated as the 3rd Battalion, 505th Airborne Infantry Regiment, 82nd Airborne Division, thus becoming the first black unit in history to become a part of an American combat division. This historic milestone was presided over by then Major General James M. “Slim Jim” Gavin, a much admired and respected World War II Commander. General Gavin, because of his effort in bringing the “Triple Nickles” into the mainstream, will always be revered by members of the 555th Parachute Infantry Association. The 3rd Battalion, 505th Airborne Infantry Regiment subsequently provided personnel for formation of the 503rd Airborne Anti-Aircraft Battalion and the 80th Airborne Anti-Aircraft Battalion. The three Battalions then provided personnel for the 3rd Battalion, 188th Airborne Infantry Regiment, 11th Airborne Division, and for the 2nd Airborne Ranger Company which became the first black unit to make a combat jump in Korea while attached to the 187th Airborne Regimental Combat Team. Without doubt, the courage and competency of black members of the units herein mentioned paved the way for the integrated military and civilian societies that all Americans enjoy today. The 555th Parachute Infantry Association was formed as a vehicle designed to pay homage to brave troopers who have preceded us and to maintain their memory by doing good works for the society in which we live. Joseph L. Murchison National President 555th Parachute Infantry Association, Inc.
Trooper Harold S. Cole offers rare insights into America's past by highlighting the tumultuous and triumphant history of the Buffalo Soldier. Growing up in North Pelham, New York, he started his military career prior to the start of World War II, and completed his service during the years of the Vietnam War. We Can, We Will, Ready and Forward are the tenets of the famed 9th and 10th Cavalry respectively, and served as Trooper Cole's motivation in life. He is more than a military man, he is a leader, disciplinarian, husband, father, and served as President for the Ninth and Tenth (Horse) Cavalry Association from 1997 to 2001. His commitment to community service and youth development establishes a foundation for future generations.